Q: Did President Xi Jinping's Special Envoy Han Zheng meet with the DPRK delegation during the Pyeongchang Winter Olympic Games? If yes, who did he meet with and what topics did they talk about? A: China has released the information on President Xi Jinping's Special Envoy and member of the Standing Committee of the Political Bureau of the CPC Central Committee Han Zheng's attendance at the opening ceremony of the Pyeongchang Winter Olympic Games. Regarding the details, I can tell you that Mr. Han Zheng talked with the head of the DPRK delegation. Q: According to reports, all 71 people aboard were killed in a Russian plane crash outside Moscow yesterday. What is your comment on that? A: As a good friend of the Russian people, we are deeply saddened by this and express deep condolences to the victims and sincere sympathy to the bereaved families. Q: The US government has nominated US Pacific Commander Admiral Harry Harris as the next US Ambassador to Australia. In the past he has been very outspoken on China-related issues. What is your comment? A: In principle, we don't comment on the personnel appointment in other countries. I would like to point out that striving for stability and development in the Asia-Pacific is the common responsibility as well as the shared aspirations of all regional countries. 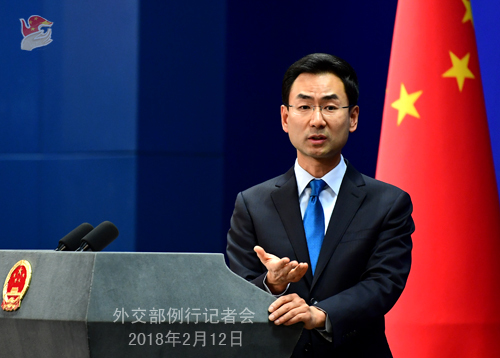 China hopes that the policies taken by relevant countries and the state-to-state relations between them can help uphold and promote peace, stability, development and prosperity of the region. Q: The DPRK leader Kim Jong-un has invited the ROK President Moon Jae-in to visit his country. What's China's position on this? A: We have noted relevant reports. China welcomes and supports the recent talks and cooperation between the DPRK and the ROK on the Pyeongchang Winter Olympic Games. The DPRK and the ROK descend from the same nationality. The improvement of their relations and advancement of reconciliation and cooperation serve the fundamental interests of the two sides and are conducive to regional peace and development. The momentum of the hard-won amelioration in the DPRK-ROK relations and the situation on the Korean Peninsula for now should be all the more cherished and upheld by all relevant parties. Just as Foreign Minister Wang Yi said last week, we hope all parties can work together so that the dialogue during the Pyeongchang Winter Olympic Games could continue as a regular one and the DPRK-ROK interactions could be extended to dialogue between all the relevant parties, especially between the DPRK and the US, and that the efforts to improve the DPRK-ROK relations be expanded into the concerted ones that will uphold peace and realize the denuclearization of the Peninsula. Q: The Swedish citizen Gui Minhai was interviewed by some Chinese media at the end of last week. Can you tell us whether he was forced to accept it or freely? After this interview, the Swedish government again reiterated its request for the Chinese government to release Gui Minhai. What is China's position? A: I believe that you have all seen Gui Minhai's interview with the media. During the interview, Gui Minhai's attitude and will was unequivocal. With regard to the reaction of the Swedish side, I want to point out that as Gui Minhai violated the Chinese law, his case must be dealt with in accordance with the Chinese law. The Swedish side has repeatedly requested the Chinese side to release him, which grossly intervenes in China's judicial sovereignty. The Chinese side has on many occasions lodged stern representations with the Swedish side on this. Q: According to reports, the Election Commission of Nepal recently announced the results of elections concerning the National Assembly and the House of Representatives, and the left-wing alliance of the Nepal Communist Party (Unified Marxist-Leninist) and the Communist Party of Nepal (Maoist-Centre) has secured a majority in both the lower and upper houses of parliament. The mainstream media in Nepal have spoken positively of the election, saying that a peaceful election is now completed, which marks the removal of the main legal obstacles to forming a new government. What's your comment on that? A: China congratulates Nepal on its successful parliamentary elections at all levels. We respect the Nepali people's choice and sincerely hope that various parties of Nepal will continue to work together with solidarity and advance smoothly the formation of a new government so as to realize political stability and economic development of the country. Q: A senior US Treasury official was here two weeks ago and asked China to expel a number of agents of DPRK banks who are operating inside China. What is the progress on that? A: I am not aware of the information you mentioned. I can only tell you that China always implements all the DPRK-related resolutions adopted by the UN Security Council in a comprehensive and strict manner. Follow-up: This was a bilateral request, not a UN request. Since State Councilor Yang Jiechi was in the US on Thursday and Friday and met Trump and released a statement saying that more cooperation was needed on the DPRK, it seems reasonable to ask that maybe this is a starting point for cooperation. A: Just now you said that the visit took place two weeks ago. That is to say, it was prior to State Councilor Yang Jiechi's visit to the United States, wasn't it? I am not aware of any information regarding that visit two weeks ago. What I can tell you is that during State Councilor Yang Jiechi's visit to the US where he met with President Trump, Secretary of State Tillerson and National Security Adviser H.R. McMaster respectively, they all had an in-depth exchange of views on the Korean Peninsula issue. China's position in the press release cannot be more clear-cut. Q: Some Chinese investors were angry about the decline in the domestic stock market last week, and they used the US Embassy's Weibo account to vent, posting comments to that account. On Saturday, we saw these comments have been blocked. Can you tell us your understanding as to what happened there? Does China see that the US is doing anything incorrect in this matter? A: You might as well ask the US Embassy in China, whose staff is responsible for the maintenance of their own account. Follow-up: It appears from our report that they did not take actions to block anything. That may have been the Weibo that blocked them. A: I have not heard about what you mentioned. As I understand, you need to ask them if there are problems with their Weibo account. If the problem cannot be solved, they may contact relevant competent authorities. 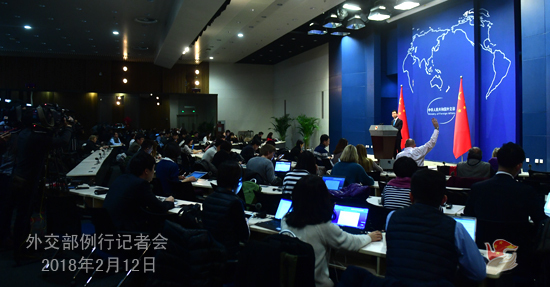 The regular press conference of the Foreign Ministry will continue till February 14 (Wednesday). It will be adjourned between February 15 (Thursday) and 21 (Wednesday), and resumed on February 22 (Thursday). During the adjournment, the Spokesperson's Office will take your questions via phone, e-mail and fax.